The Transactions was one of several attempts by Dwiggins to stir up interest among publishers in hiring him to do book designs. It did not succeed immediately, but within two years he had begun to shift his career from advertising design to book design with several projects, among them a limited edition and a trade edition of My Mortal Enemy by Willa Cather for Alfred A. Knopf, Inc., which marked the beginning of his long association with the New York publisher. Proposed design by W.A. 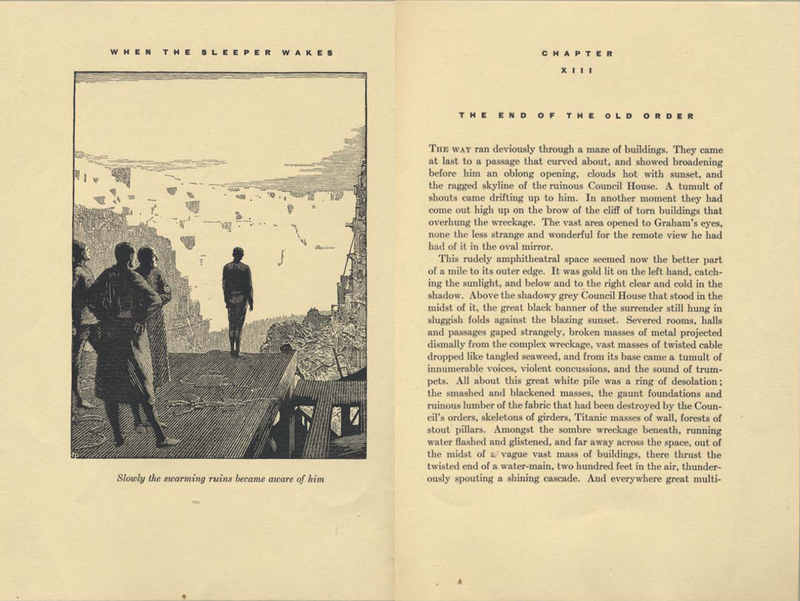 Dwiggins for spread from When the Sleeper Awakes by H.G. Wells. From Transactions of the Society of Calligraphers, Bulletin No. I, Part I (January 1, 1924). In 1929 Dwiggins convinced Random House to let him design an edition of The Time Machine in “the modernist manner.”  The book, which was published two years later, was his first H.G. Wells design—but not his last. Four years after that he began work on an illustrated edition of The Treasure in the Forest for Melbert B. Cary, Jr.’s Press of the Woolly Whale. It was completed in 1936. And then in 1941 Dwiggins designed The History of Mr. Polly for The Press of the Reader’s Club (an imprint of The Limited Editions Club). Along with these three books intended for the bibliophile market, there was another book by Wells that Dwiggins designed as a standard trade edition: Seven Famous Novels by H.G. Wells (New York: Alfred A. Knopf, 1934). Title page spread of The Time Machine: An Invention by H.G. Wells (New York: Random House, 1931). Design, lettering and illustrations by W.A. Dwiggins. Although Dwiggins designed his first book for Knopf in 1926, his close association with the publisher did not truly begin until 1934. Of the 22 books he worked on for Knopf between 1926 and 1933, he was responsible for the typography for only five of them. For the other seventeen he did jackets, bindings, title pages or a combination of those three elements—but nothing more. However, from 1934 until his death in 1956, his work for Knopf focused either on the whole book or the typography. Out of 308 books he worked on during those twenty-two years, there were only ten in which his involvement was limited to the binding. It can be argued that Seven Famous Novels by H.G. 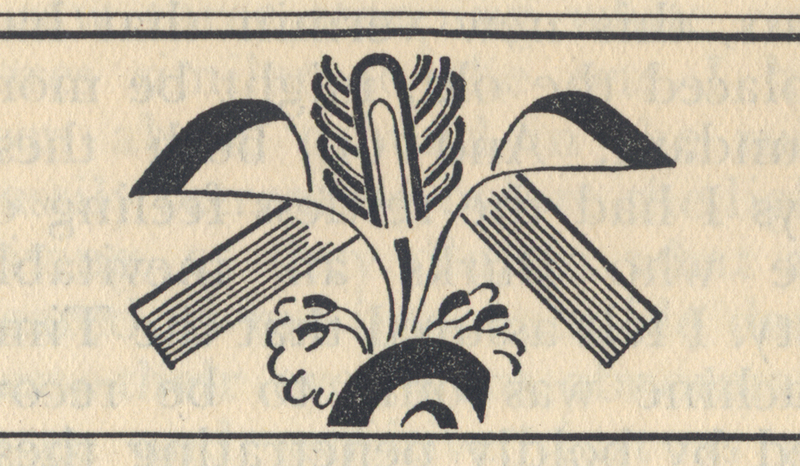 Wells was the first complex book that Dwiggins designed. 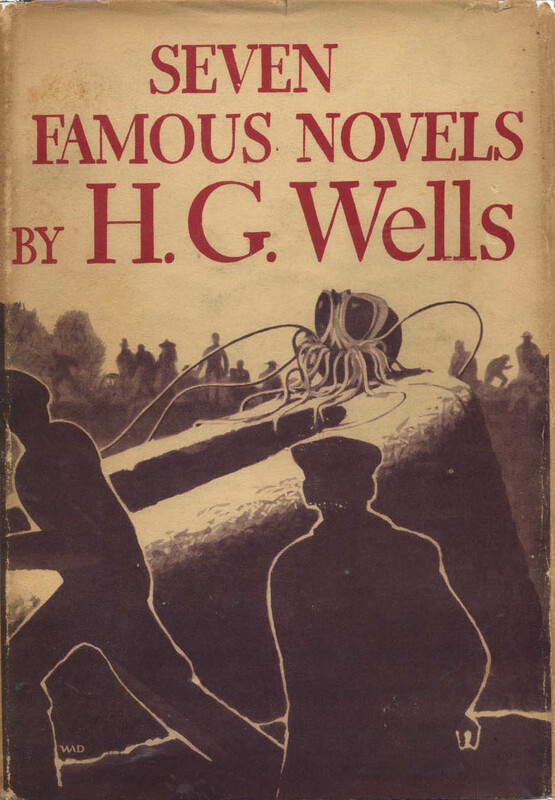 Jacket for Seven Famous Novels by H.G. Wells (New York: Alfred A. Knopf, Inc., 1934). Design, illustration and lettering by W.A. Dwiggins. This “War of the Worlds” of Wells is an account—told in the first person—written by a man who saw it all. I have put another man at his elbow who should see all that the narrator saw, and should make such drawings as circumstances permitted—sometimes thumb-nail notes on the backs of envelopes, under fire you might say—and again more leisurely performances, when he had time to look around a bit. Then I should distribute these drawings—without title lines—so that they would fall in with the text—graphic marginal notes (not in the margins!). 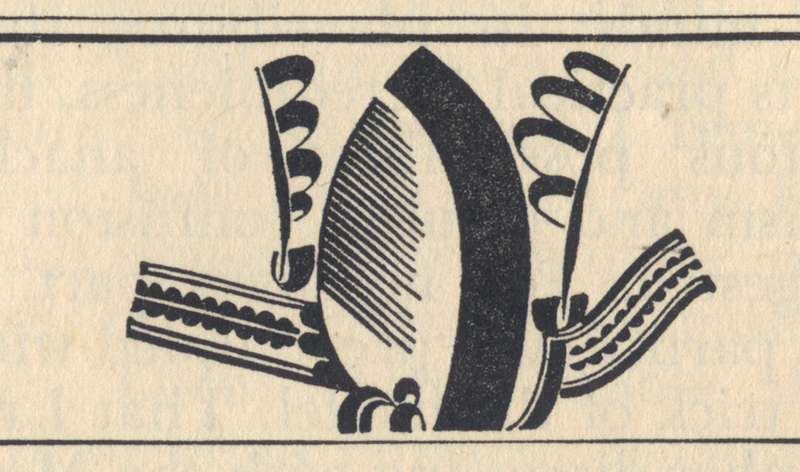 There are several different illustrations in Transactions as Dwiggins argues for the value of a sketchy approach over a detailed one as being truer to what someone in the heat of the moment would produce. In all of them he focuses on one showing one of the alien machines attacking villages in the English countryside. Here is his preferred style of illustration. 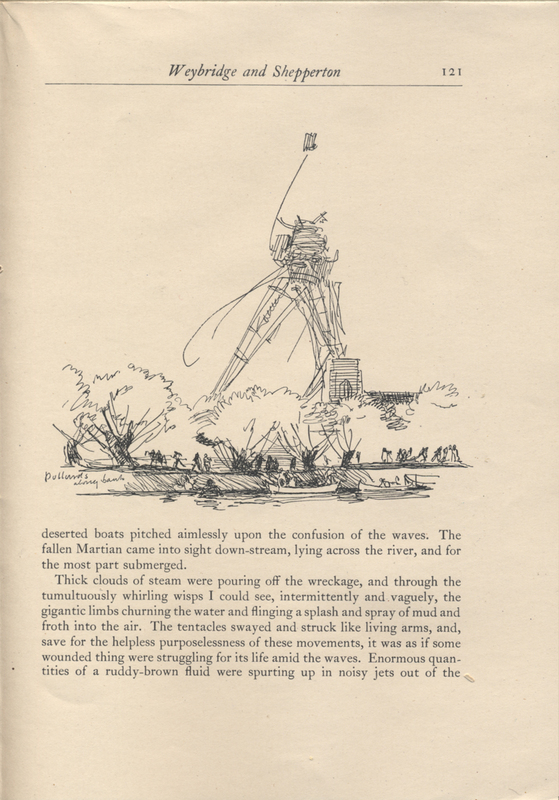 Speculative page for The War of the Worlds by H.G. 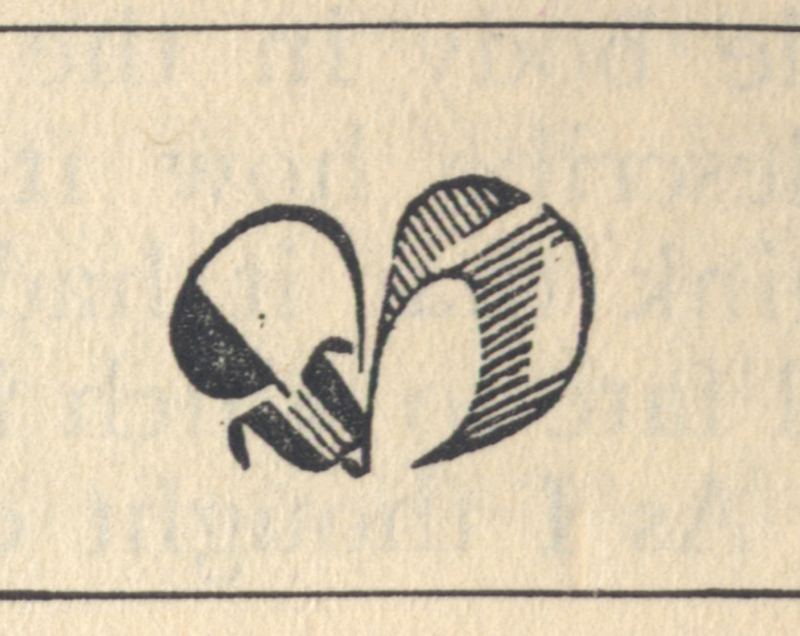 Wells from Transactions of The Society of Calligraphers Bulletin 1, No. I (January 1, 1924). Typography and illustration by W.A. Dwiggins. 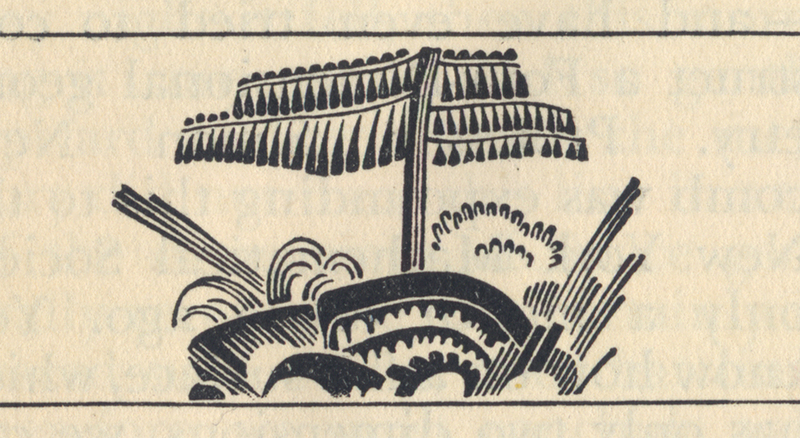 Dwiggins was not too disappointed by the decision to abandon the idea of an illustrated edition. “I was not too keen about undertaking to make them in a hurry anyway—and the book will be lively as is,” he told Jacobs. Having an illustrated jacket was compensation enough, he explained. But the unspoken reason was that Dwiggins had figured out a way to get some visual life into the book without resorting to illustrations. Seven Famous Novels is a fat book of 860 pages. Even at that length, Dwiggins had to resort to a double-column format to fit in all of the text, which is set in Linotype Baskerville. To relieve the monotony of so much text, Dwiggins inserted small stencil ornaments at the beginning of each chapter of each novel. These divider ornaments are reminiscent of the small ornaments used in his redesign of Harper’s Magazine (see The Definitive Dwiggins nos. 50 and 53), though they are different in style. 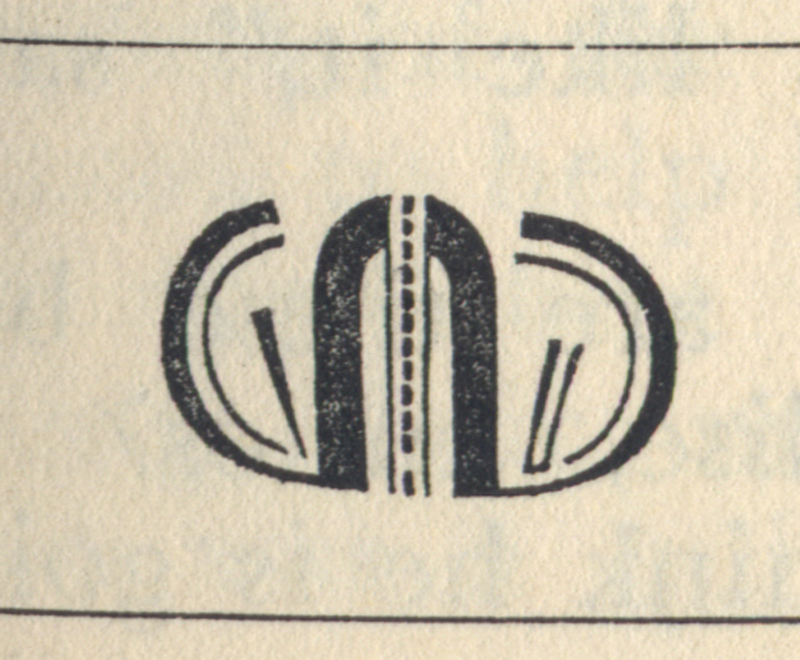 There are nine ornament designs, which are used in rotation throughout the book. They are all abstractly organic, reflecting Dwiggins’ increased confidence with the stencil process. 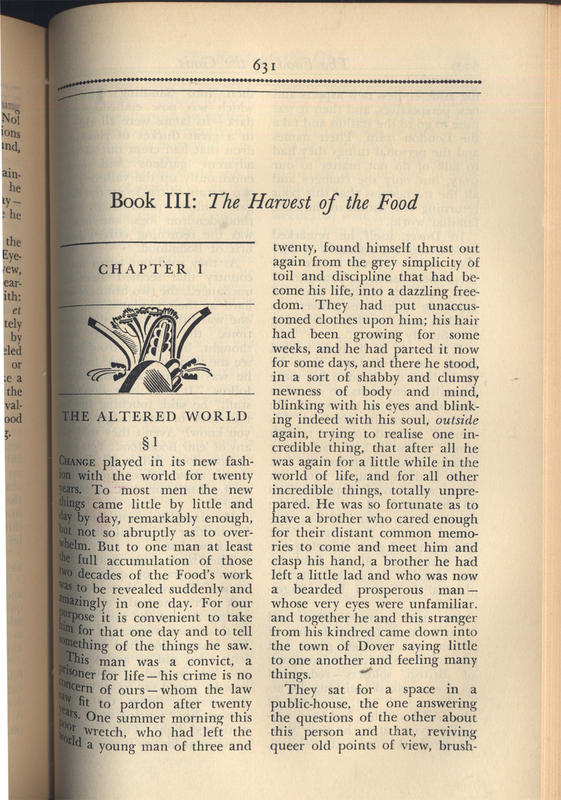 The opening of Book III: The Harvest of the Food, p. 631 from Seven Famous Novels by H.G. Wells (New York: Alfred A. Knopf, 1934). 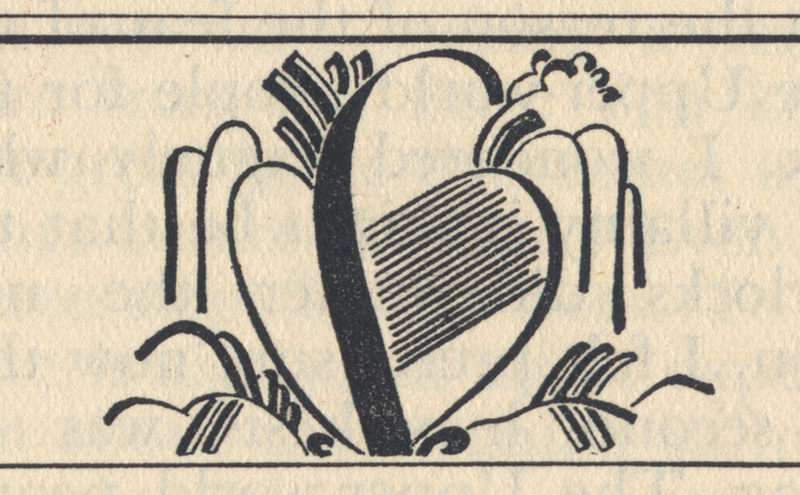 Typography and stencil ornament designed by W.A. Dwiggins. This is ornament no. 3. The ornaments are sandwiched between two rules to set them off from the justified columns of type. Here are all nine of them in their order of first appearance in the book. Ornament 1 from Seven Famous Novels by H.G. Wells (New York: Alfred A. Knopf, 1934). Design by W.A. Dwiggins. Ornament 2 from Seven Famous Novels by H.G. Wells (New York: Alfred A. Knopf, 1934). Design by W.A. Dwiggins. Ornament 3 from Seven Famous Novels by H.G. Wells (New York: Alfred A. Knopf, 1934). Design by W.A. Dwiggins. Ornament 4 from Seven Famous Novels by H.G. Wells (New York: Alfred A. Knopf, 1934). Design by W.A. Dwiggins. Ornament 5 from Seven Famous Novels by H.G. Wells (New York: Alfred A. Knopf, 1934). Design by W.A. Dwiggins. Ornament 6 from Seven Famous Novels by H.G. Wells (New York: Alfred A. Knopf, 1934). Design by W.A. Dwiggins. Ornament 7 from Seven Famous Novels by H.G. Wells (New York: Alfred A. Knopf, 1934). Design by W.A. Dwiggins. Ornament 8 from Seven Famous Novels by H.G. Wells (New York: Alfred A. Knopf, 1934). Design by W.A. Dwiggins. Ornament 9 from Seven Famous Novels by H.G. Wells (New York: Alfred A. Knopf, 1934). Design by W.A. Dwiggins. 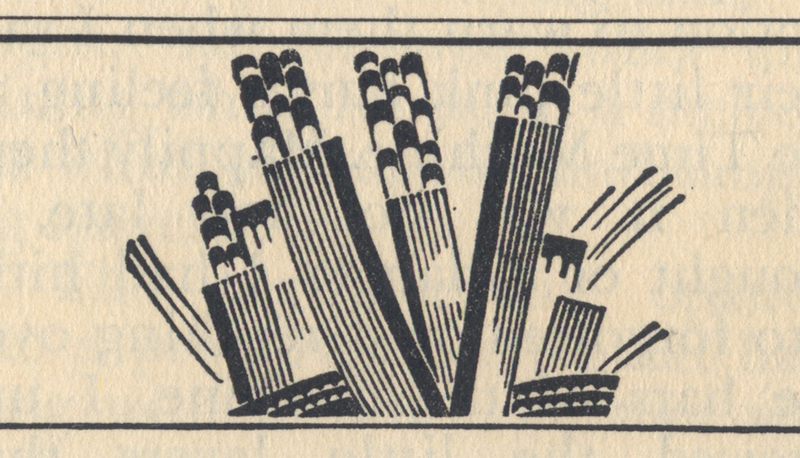 A few years after the completion of Seven Famous Novels Dwiggins had another chance to illustrate H.G. Wells. For Melbert B. Cary, Jr. (1892–1941) and his Press of the Woolly Whale he designed The Treasure in the Forest, a novel not included in the Knopf collection. But the story of that Dwiggins design will have to wait for another Definitive Dwiggins post. The Society of Calligraphers was created by Dwiggins in 1919 as a vehicle to advance his ideas and his career. Dwiggins was its secretary and Dr. Hermann Püterschein, the alter ego he had invented in 1913, was its president. There were no members until 1925 when Dwiggins declared twenty-two individuals in the graphic arts field to be honorary members. Transactions of the Society of Calligraphers, Bulletin No. 1, Part I (January 1, 1924), [p. 1]. W.A. Dwiggins to Donald Klopfer 3 May 1929. Columbia University Rare Book and Manuscript Library, Bennett Cerf Manuscript Collection, Box 165. 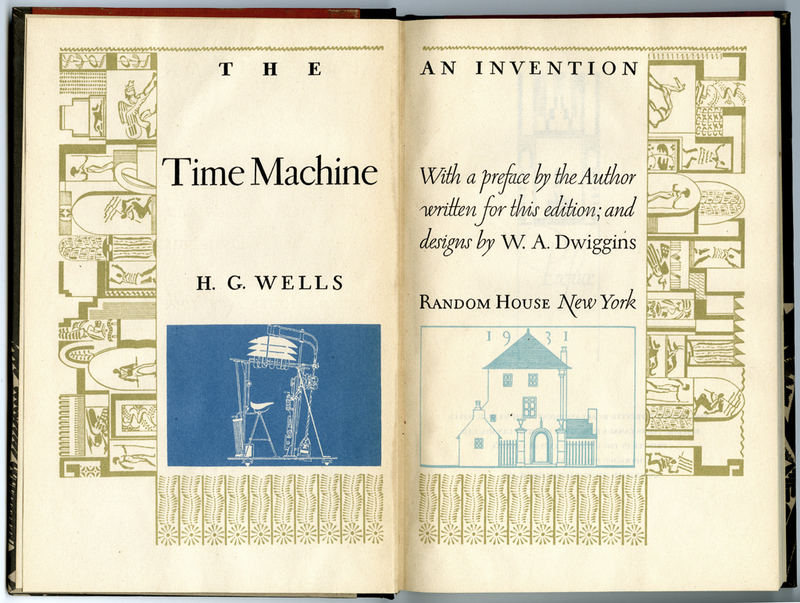 The full story of the development of Dwiggins’ design of The Time Machine will appear in a future post. Transactions of The Society of Calligraphers Bulletin No. 1, Part II (January 1, 1924), p. . The text is ascribed to Mr. Püterschein. W.A. Dwiggins to Sidney Jacobs 14 April 1934. University of Texas, Harry Ransom Humanities Research Center, Alfred A. Knopf, Inc. Papers, Box 731, Folder 13. Also see Dwiggins to Jacobs 5 April 1934. Dwiggins was paid $100 for the jacket design. See Boston Public Library, W.A. Dwiggins Collection 1974, Box 81(2), Folder 14: entry for June 11, 1934. See University of Texas, Harry Ransom Center for the Humanities, Alfred A. Knopf, Inc. Papers, Box 734, Folder 3 with trial pages dated 17 October 1933, various tissue comps, and a pen-and-ink comp for the jacket design without the illustration. W.A. Dwiggins to Sidney Jacobs 5 April 1934. University of Texas, Harry Ransom Humanities Research Center, Alfred A. Knopf, Inc. Papers, Box 731, Folder 13. Wells, H.G. Seven Famous Novels. (New York: Alfred A. Knopf, 1934). 860 pp., 5.625 x 8.25. Typography, decorations, binding, and jacket by Dwiggins. Set in Linotype Baskerville by the Plimpton Press. Two-column format. Printed and bound by the Haddon Craftsmen. Orange cloth over boards. Stamped in black on spine, blind-stamped on cover. There is also a “deluxe edition” published by Garden City Publishing Co., which varies only in paper, title page, and cloth. 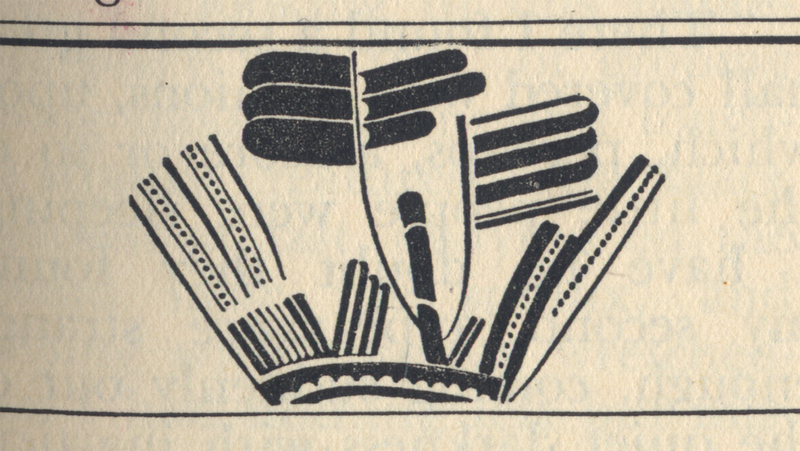 AIGA Fifty Books, 1935. Number 34.07 in The Books of WAD: A Bibliography of the Books Designed by W.A. Dwiggins by Dwight Agner (Baton Rouge: The Press of the Nightowl, 1974). W.A. Dwiggins to Alfred A. Knopf, 11 June 1934. University of Texas, Harry Ransom Center for the Humanities, Alfred A. Knopf, Inc. Papers, Box 562, Folder 2. Dwiggins was paid $125 for the book design. See Boston Public Library, W.A. Dwiggins Collection 1974, Box 81(2), Folder 14: entry for June 11, 1934. While Knopf paid him for the jacket, Plimpton Press paid him for the book design. W.A. Dwiggins to Sidney Jacobs, 24 April . University of Texas, Harry Ransom Humanities Research Center, Alfred A. Knopf, Inc. Papers, Box 731, Folder 13.